What did you like and/or dislike about the Scripture you read this week and/or last week’s sermon? What stood out to you in a new way? I know we’re not on Genesis, but something struck me as I was thinking back on it. After all Joseph’s brothers did to him, Joseph not only forgave them, but he saw that God intended what happened for good – for God’s plan and that is all that mattered to Joseph. He loved his brothers and took care of them. Joseph was not the leading role in his own story. God was. When we say die to self, I think Joseph is the perfect example. Are you still playing the leading role in your story? 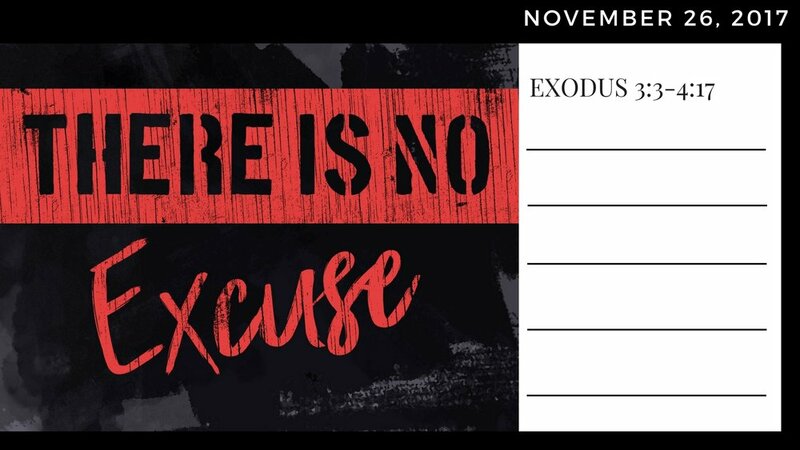 Do you make excuses when God is calling you? Why is no excuse legitimate? When have you followed God despite your excuses? How did it work out? Nate pointed out that Moses’ insecurities were his excuse. What are your insecurities that are keeping you from doing what God wants you to do? What are you going to do about it? Are their past mistakes and fear of judgement keeping you from following? Several times in class we have talked about being introverts. Have you considered that is just another excuse Satan is using in your life? What are your thoughts? If God is calling you to do something, do it! Jo Morton writes these discussion questions and leads The Journey Ladies Bible Study. Jo works at Williams Company in Tulsa, enjoys playing and singing all kinds of music, and is involved in many mission efforts at The Journey. Email Jo.